A’ International Home Appliances Design Awards and Competition is Looking for Best Design Projects Among Talented Designers, Companies and Brands Worldwide. The A' International Home Appliances Design Award is annually organized by A' Design Award and Competition in order to select and honor best design projects imagined and produced by industrial and product designers, creative engineers, appliances manufacturers and appliance brands worldwide. The A' Home Appliances Design Award 2018-2019 is a two step competition which is accepting design works and concepts developed within the last 10 years. The first step is to register and submit design projects at A' Design Award web site. All submissions are receiving a free preliminary score which allows designers to proceed with a second step of project nomination. 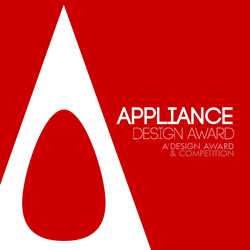 Deadline for entries to the A' Home Appliances Design Award is on February 28, 2019 and results of the competition will be announced on April 15, 2019. Laureates of the A' Home Appliances Design Award 2018-2019 will be granted the A' Design Prize which contains a series of PR, marketing and publicity tools to celebrate status of winning the A' International Home Appliance Award. In addition, awarded designers will be entitled to the design excellence certificate, lifetime license to use the A' Home Appliances Design Awards winner logo, yearbook of best designs, exhibitions of awarded works in Italy, exclusive trophy and two personal invitation to take part in the A' Design Awards’ Gala Night ceremony, as well as inclusion in Best Designs of the World and World Design Consortium. Moreover, winners of the A' Home Appliances Design Award will also get an exclusive interview which will be published at Designer Interviews together with an inclusive press kit that will be prepared for every project that contains the press release for award announcement in addition to design and designer images, logo of the designer and the client, dozens of high resolution photos for added exposure including a portfolio that contains previews of other successful designs projects.